Today , Thursday, December 8 2005 is the twenty fifth anniversary of John Lennon's assassination by that ignoble cipher Mark David Chapman, and as much as one wants to deny that they remain obsessed with the great glory of their fiery youth, a day of this kind makes me none the less want to meander around the old and overgrown ground of the past and wonder how things might have been different. But the motives are selfish, as they always have been with me, and I am less concerned with the winsome utopia Lennon wanted to bring us to had Chapman not found his gun and his target, but rather with the decline of Lennon's music, post-Beatles. My position is simple and probably simple minded; Lennon was a pop music genius during his time with the Beatles, collaborating or competing with Paul McCartney, definitely at the top of his songwriting and performer game, and with the introduction of Yoko Ono into his life, we see a lapse into the banal, the trivial, the pretentiously bone-headed. 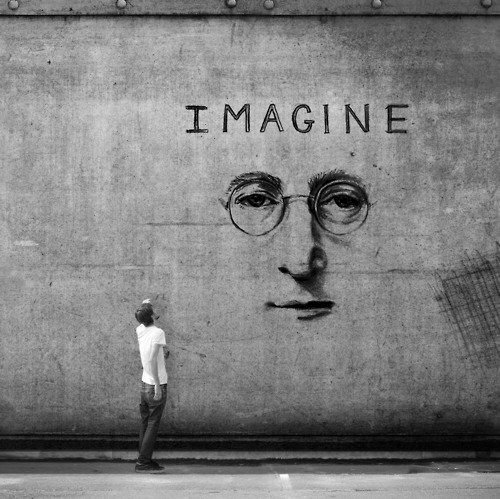 Yoko Ono did much to make Lennon the worst example of wasted genius imaginable. Though he did make some great rock and roll during his post-Beatle time, and wrote and recorded a handful of decent ballads, his artistry took a nose dive he never had a chance to pull out of. He was monumentally pretentious, head-line hungry, and cursed with an ego mania that over rode is talent. He stopped being an artist, and a rock and roller, and became the dread species of creature called celebrity; the great work that made is reputation was behind him, and there was nothing in front of him except brittle rock music with soft headed lyrics, empty art stunts, and drugs, drugs, drugs. A sad legacy for a great man. The fact of the matter is that Lennon's greatness was possible in large part because of his collaborations, full or partial, with Paul McCartney. Both had native musical instincts that balanced each other: the proximity of one to the other kept them on their best game. The sheer genius of the entire Beatle body of work versus the sketchy efforts from both Lennon and McCartney under their own steam bears this out. Lennon never found anyone to replace McCartney, and certainly never had anyone who challenged to do better, smarter work. Yoko certainly didn't give him anything that improved his music, and her lasting contribution to his career is to give him the errant idea that performing under your ability equals sincerity. It equaled excruciatingly inadequate music. What's amazing for an anniversary as seemingly monumental as this is the paucity of new insights, previously unavailable information, or especially interesting critical estimations of their estimable body of work. It is a topic that has been exhausted, it seems, since scrutiny on all matters and personalities pertaining to the Beatles has been unceasing since their demise. We have, essentially, is reruns of our own memories, repackaged, remodeled, sold to us again, and endless of things we already know intimately and yet consume compulsively because we cannot help ourselves.It cheapens the term, but "addiction" comes to mind. There is nothing to add to the Beatles legacy except perhaps add our anecdotes to the ceaseless stream of words that seek to define their existence and importance even today. It's no longer about what the Beatles meant and accomplished in altering the course of history or manipulating the fragile metaphysical assumptions we harbor, for good or ill;we've exhausted our best and largest generalities in that regard, and the task will fall to historians, philosophers and marketers after most of us are dead as to what The Beatles and their songs are worth as art and commercially exploitable assets. For us there remains only a further dive into autobiography, where we might yet find some clue and excitement as to how these guys became an informing influence on our individual personalities.John Lennon and the Beatles changed my life in a major and unalterable way during their existence, and this was something I came aware of only after watching two hours of CNN wall-to-wall coverage of the assassination. I broke down, tears came, I was a senseless, doom-stricken mess, even though at the time I loudly bad-mouthed the pasty, hippie-flake dilettantism of his later work. None of what I thought I mattered mattered in that instance.John Lennon was dead and it was like losing some essential part of myself whose loss would never be filled with anything even half as good or worthy.He still mattered to me in my life quite despite the fact that I'd had what amounted to an argument with him over is politics and his music during the length of his solo career, but despite my best efforts to break off into new sounds and ideas and leave Lennon and the Beatles behind, his death hit as would the death of a family member. For good or ill, his work and the crude course of his ideas helped in the formation of values and attitudes that still inform my response to celebrity and events, no less than Dylan, and no less than reading Faulkner, Joyce , or viewing Godard films. The deification that he's had since the killing is the kind of sick, fetish culture nostalgia that illustrates the evils of unalloyed hero worship, a need to have a God who once walked in our midst. This bad habit turns dead artists who were marginally interesting into Brand Name , icons whose mention confers the acquisition of class and culture without the nuisance of having to practice credible discernment: every weak and egocentric manuscript Kerouac and Hemingway, among others , has been published, and the initial reason for their reputations, graspable works you can point to, read and parse, become obscured as a result. Lennon, in turn, becomes less the musician he was and becomes, in death, just another snap-shot to be re-marketed at various times, complete with booklets containing hyperbole-glutted prose that , in essence, attempts to instruct me that my own response through a period I lived in is meaningless. Such hype utterly refuses to let newer listeners come to their own terms with the body of work. It is no longer about Lennon's music, it's about the promotion machine that keeps selling him. This is evil. Lennon, honest as he was most of the time when he had sufficient distance from his antics, would have told us to get honest as well and admit that much of his later music was half-baked and was released solely because of the power of his celebrity. This may well be the time for an honest appraisal of his work, from the Beatles forward, so that his strongest work can stand separate from things that have a lesser claim to posterity. Magazines and online media have used Lennon and the Beatles for no than their value as nostalgia icons in an attempt pathetic glimpses of their own history. It's only business, nothing personal, and that is exactly the problem. Risky to assume what Lennon might ultimately have sounded like had he not been killed, since he had the ability to switch games suddenly and quickly so far as his musical thinking went. This was a constant quality that kept him interesting, if not always inspiring: there as always a real hope that he would recover inspiration, as Dylan had after some weak work, or as Elvis Costello had after the soggy offerings of Trust or Goodbye Cruel World. Even the weaker efforts of Lennon's' late period were marked by his idiosyncratic restlessness, and the songs on Double Fantasy, domesticated that they are, might well have been transitional work, a faltering start, toward new territory. It's laughable that Lennon might ever have become as lugubriously solemn as Don Henley, but there's merit in saying that Lennon's work might become par with Paul Simon's: Simon's work is certainly more than screeds praising the domesticated life, and he is one of the few songwriters from the Sixties whose work has substantially improved over the forty years or so. If Lennon's work had become that good, on his own terms, it would have been a good thing, though it'd be more realistic to say that a make believe Lennon rebirth of great work would be closer in attitude and grit to Lou Reed and Neil Young, two other geezers whose work remains cranky and unsatisfied at heart. Since his death, it'd been my thinking that Lennon would have transcended his cliches as some of contemporaries had.